Modern, high-quality off-grid lighting and energy products can transform lives. Over the last decade, a concerted global push has created thriving markets for these products, demonstrating that off-grid solutions can complement sustained grid electrification to accelerate the rate of bringing electricity to the roughly 1.1 billion people who lack this service. According to the 2018 Off Grid Solar Market Trends Report, today, off-grid solar products are reaching an estimated 73 million households, or over 360 million people, globally. Equally impressive is how the market has evolved and expanded. New technologies and innovative products and companies are being launched every year. At the same time, many governments across the world are strengthening their policy environments to facilitate this transformation. Starting in Africa and later expanding to other regions, ESMAP has provided technical and financial support to fuel this revolution. It has helped leverage millions of dollars in World Bank investment, strengthen policies, and engage the private sector to accelerate off-grid electrification. In 2009, ESMAP partnered with the International Finance Corporation (IFC) to launch Lighting Africa—a pioneering initiative to develop a commercial market for the manufacture and sale of quality solar lanterns to light up the lives of 600 million people without electricity across Sub-Saharan Africa. While Africans were spending nearly US$10.5 billion on kerosene lighting products every year, companies selling and manufacturing off-grid solar products were unable to break into the vast, untapped off-grid solar market. Manufacturers were struggling to find business partners. Consumers were not aware of new technologies and low-quality products were pervasive, destroying confidence in the entire market. Financial institutions, unfamiliar with the industry, were unable or unwilling to exploit the market’s growth potential. ESMAP was a catalyst for changing this landscape. The first step was to put together the conceptual framework for Lighting Africa. This process was an essential step to bring together manufacturers, distributors, consumers, financial institutions, development partners, and governments to remove obstacles to market development. Second, ESMAP developed a solid quality assurance mechanism the standards of which grew into globally accepted benchmarks for manufacturers and consumers. To build consumer knowledge about available products, ESMAP helped design and implement public awareness campaigns. Finally, ESMAP focused on the development of distribution channels, access to financing for product importers and distributors, as well as in-depth market intelligence on product design and customer preferences. 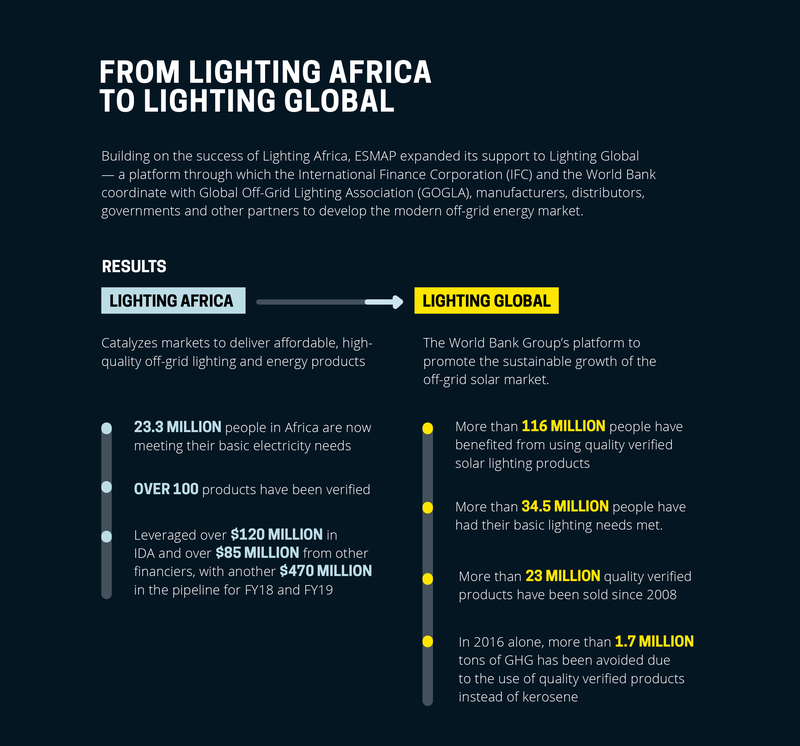 The unprecedented success of Lighting Africa gave rise to the World Bank Group’s Lighting Global initiative to fight energy poverty in the Americas, South Asia, East Asia, and the Pacific. In coordination with the Global Off-Grid Lighting Association (GOGLA), Lighting Global supports acceleration of off-grid electrification, working with both the private sector and the governments, supporting market intelligence, quality assurance, access to finance and business support services, and consumer education. ESMAP supports Lighting Global by engaging governments through World Bank lending projects and policy dialogue. As of June 2017, ESMAP helped to leverage over US$120 million in World Bank funding and over US$85 million from other financiers to invest in the off-grid solar market in several countries. It achieved that by supporting the creation of the right policy environment, integrating off-grid solutions into broader electrification planning, and strengthening product quality standards. Increasingly, ESMAP is also helping countries to set up financing facilities for off-grid energy companies, to accelerate the pace of electrification, and reach out to poorer and more remote customers that the commercial market alone is unable to reach.